It has been a while since I've shared a new recipe here on the blog, but this one is definitely worth the wait. To be perfectly honest, the past month's meals and snacks have all been prepared at the last minute without too much thinking and without a camera nearby to snap a few shots before they have been eaten. Nevertheless, on Friday evening I whipped this delicious recipe up for dinner and I decided it was far too good not to photograph and share with you all. Forgive the less-than-perfect lighting and styling - I had to take these shots before it got too dark in the kitchen so was in a bit of a hurry! This recipe can be enjoyed all on its own as a main, or perhaps with the addition of some kind of protein source. It's really quick and easy to prepare, and requires little to no planning or effort at all (unless of course you purchase a whole pomegranate and pick out the rubies one by one as I did haha). The best part about it is that it tastes great even a few days after being prepared, so makes for the perfect weekday lunch that can be packed and taken along wherever you need it. A delicious, fragrant salad that makes for the perfect meal when the weather is warm and sunny. Place the couscous in a large bowl and cover with the just-boiled water (use about twice the volume of the cous cous). Cover the bowl with a plate and leave to soak for 10 minutes. Meanwhile, chop the fresh coriander roughly. When the couscous has soaked up the water, use a fork to fluff it up. Mix in the olive oil and season with salt and pepper to taste. 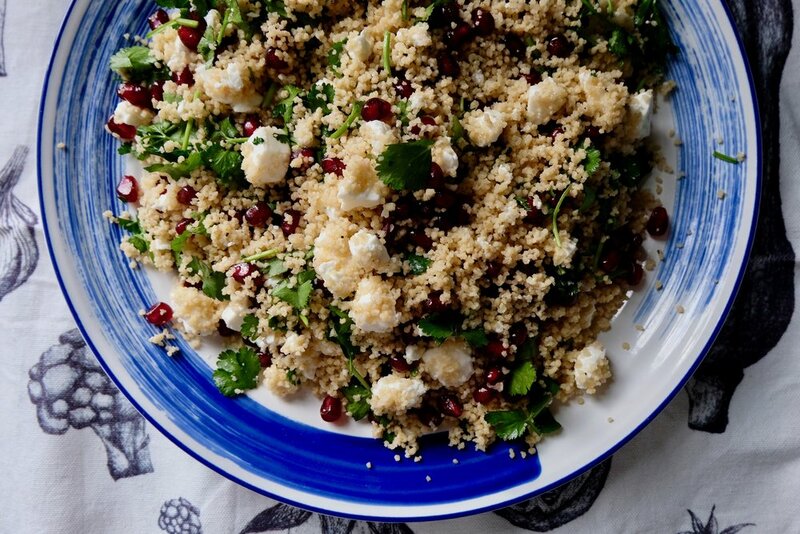 Mix in the pomegranate rubies, chopped coriander, crumbled feta cheese, and lemon juice. Enjoy!